Frances Bean Cobain is truly her father's daughter. The 20-year-old scion of Nirvana frontman and grunge idol Kurt Cobain channeled her father when she was out about in Los Angeles last week with disheveled pink hair and round retro shades. 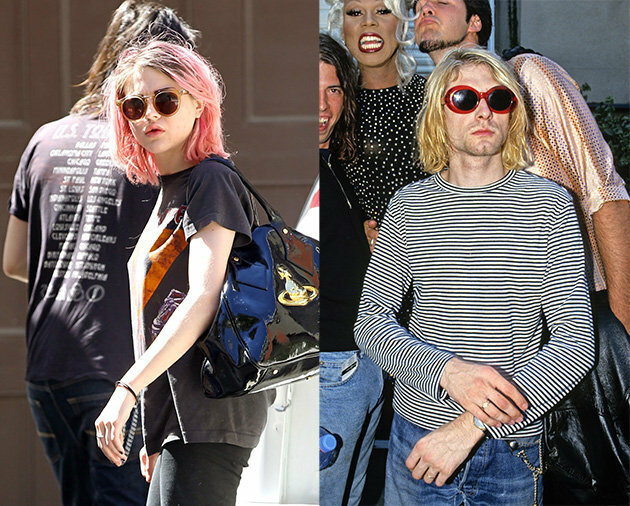 Although her father died when she was just a baby, Frances Cobain's likeness to Kurt both in looks and taste is undeniable. 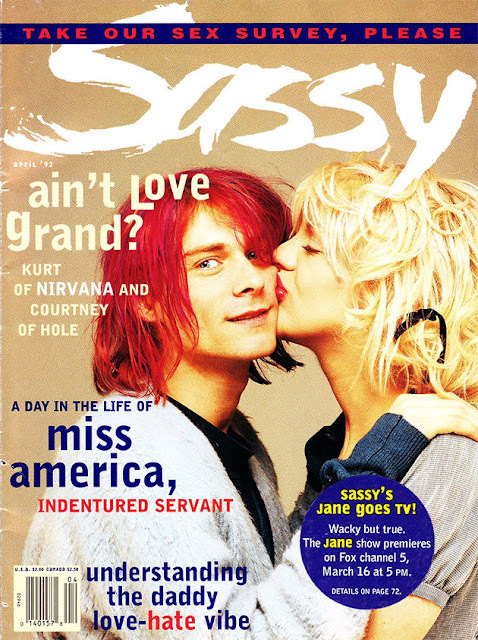 Kurt himself had pink/red shoulder length-hair right before Frances was born, perhaps most notably seen in a truly adorable cover shoot with wife Courtney Love for the long-defunct Sassy magazine's April, 1992 issue. Frances completed the casual outfit with a vintage Iron Maiden tee, black jeans, bag from haute punk designer Vivienne Westwood and metal-tipped lace-up boots. While grunge throwback fashion is breaking on the mainstream for the under-thirty crowd, when the only child of the movement's king rocks the look, we all take notice. Last Wednesday, Frances Cobain's alleged stalker Marc James Franco was concluded to be unfit for trial following a psychiatric evaluation. Franco had broken into Cobain's home last October and prompted the Nirvana heiress start a Twitter account and to fire of a series of tweets explaining Franco's "rabid obsession" with her father Kurt and his threats against her fiancé Isaiah Silva and herself.